This is the year. This is your moment to do things differently. Getting a head start on your new year planning sets the stage for your entire year. It helps you stay focused on what’s most important and avoid distractions that keep you from making steady progress toward your goals. Lifestyle design requires envisioning, strategizing, time management, and accountability. That’s why paper planners have never gone out of style despite the many convenient online calendars that have flooded the market. I use an online calendar to manage appointments, too, but wouldn’t trade my paper planner for anything. Your planner serves as a visual reminder of what’s most important to you, why you’re doing what you’re doing, and where your path is leading you. 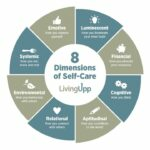 The Self-Care Planner was designed to help you manage both your personal and professional goals (see more planner images here), but there are many other great planners out there too: Franklin Covey planners, the Desire Map Planner by Danielle LaPorte, and the Passion Planner, just to name a few. The main reason I chose to design my own planner was that I wanted more white space, more freedom to sketch out my plans depending on my mood, and more flexibility to change my planning approach mid-year if I chose to. I also wanted fewer generic motivational quotes and more space to do actual planning and mapping. But more importantly, I wanted to keep self-care at the forefront of my life. I love starting my day with the Rate Your 8 assessment and using the monthly tracker to hold myself accountable for the goals I’ve set. And I LOVE the excitement I feel every time I so much as glance at my vision board. Talk about motivation! What do you really, really, really want? What turns your head? What turns you on? What do you want to do more of? Get clear on how you want to experience your life — what you want to do, be, have, and feel in the coming year. One easy approach is to draft one or more clear goals within each of the 8 Dimensions of Self-Care, even if it’s to simply continue doing what you’re doing. This will help ensure that you aren’t neglecting one or more important areas of your life. This year do you want to feel calm or adventurous? Do more meditation? Be recognized as a top-performer on your sales team? Have more free time? What exactly is it that you want? Please resist the urge to call attention to all the stuff you DON’T want, and stay focused only on manifesting what you DO want. And stop saving all the good stuff for later — for retirement, vacation, when your kids leave for college. Nope. Put it all down on paper. All of it. Remember, this is your chance to make 2019 your best year yet. Create a list of possibilities for how you might bring your desires to life. Whether you come up with 5 things or 500 things, what matters most is that you think without limits. Ask friends and family to help you if necessary, but include everything. And let’s be honest, most of us have pretty full plates already. Remember that sometimes the fastest way to achieve a goal is to release something rather than adding something new. Quitting, declining, resigning. Yep, all viable possibilities for goal achievement. And here’s a bonus tip: the best possibilities are the ones that bring your goals into reality in the fewest steps possible. Don’t get so tied to specific outcomes that you overlook better opportunities when they come your way. Something better than you imagined might just materialize as you move toward your goals, so stay open. Planning is one thing, but executing your plan is where it all comes together. When you begin to consistently invest your attention, time, and energy into what you really, really want, the results will come. Use an app or paper tracker to monitor your progress, or find an accountability partner to chat with every week. This will help you maintain momentum and motivation to keep going. Plus, doing what you say you will do feels pretty incredible. Need help pulling life together? This entry was posted in Self-Care Strategies and tagged lifestyle redesign, planning, retreat.